Double bill of short films from the Czechoslovak New Wave artistic movement of the 1960s. The debut feature of master filmmaker František Vlác(il (Marketa Lazarová; The Valley of the Bees) The White Dove’s straightforward narrative belies complex themes and striking visual imagery. A young boy injures and then nurses a white dove back to health so that it can continue its journey home. Echoing Ken Loach’s film Kes, and with music by the great Zdenek Liška, the film emerges as a work of great poetry and humanism. The surrealist Josef Kilián (making its world-première release on DVD) is a dark and absurdly humorous, biting allegory of life under a totalitarian regime. 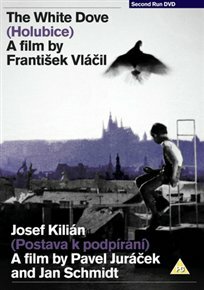 Inspired by the grotesque nightmares of Franz Kafka and another icon of Czech literature, the anti-militarist, anti-authoritarian Jaroslav Hasek, the film was supressed by the authorities after the Soviet invasion of 1968. Having made only four films, and despite being the author of the screenplays for Jindr(ich Polák’s Ikarie XB 1, Ve(ra Chytilová’s Daisies and Karel Zeman’s A Jester’s Tale, Jurác(ek remains one of the Czechoslovak New Wave’s most neglected artists. This Special Edition, two-film DVD presents both films in new digital transfers with restored picture and sound and features a 24-page booklet with new essays on both films by author Peter Hames. A short excerpt from the booklet essay by Peter Hames. The story of Josef Kilián follows the fate of an unnamed hero who finds himself involved in an increasing number of absurd situations. One day, he discovers a shop in a side street that is offering cats for loan. He borrows one but, when he attempts to return it, discovers that the shop has disappeared. In his attempts to find a legitimate way of returning the cat, he is taken on a journey through a society governed by bureaucracy. While he is unable to find answers, he constantly has to justify himself and provide explanations for his own behaviour. When he arrives at the final office in the chain, where the elusive Josef Kilián is supposed to explain everything, he finds an empty room with the telephone ringing. In the film’s penultimate scene, he has a conversation with a man he mistakes for Kilián, but who also has a cat in tow. The film’s primary target is, of course, a world of bureaucracy typical of the Communist period but bearing more than a passing resemblance to the rule of officialdom anywhere. This bureaucratic world takes a variety of forms – the official sitting half way up a wall of filing cabinets, the man who reminds him of his own responsibilities and of the literacy rate in Brazil, and the labyrinth of corridors that finally lead to an empty room. Identity cards have to be constantly shown. If the old buildings and palaces of Prague seem to embody the spirit of bureaucracy itself, the film also addressed the present. On the wall of the waiting room outside the empty office hangs an empty folder labelled ‘Workers suggestions’. The only newspaper is in Arabic and the room soon fills with people with their own experiences of the absurd. The film also makes direct reference to the Cold War and the death of Stalinism. At the beginning of the film, the hero passes through a corridor littered with banners and slogans from the 1950s – “Cholera. Plague. Flies. Truman’s Allies!”, “The Komsomol is our example”, “More coal for the Republic”. There are cartoons of Uncle Sam, Truman and the infamous Colorado beetle. The sequence ends with a portrait of Stalin. At the end of the film, the hero walks toward the camera framed by the pillars that had once stood beside the largest statue of Stalin in Europe. (Erected in 1955, it had to be blown up ‘secretly’ in 1962 when the ‘course for change’ was implemented). The Czech title for the film translates roughly as ‘A Figure Needing Support’ and this opens it up to a wide interpretation. The hero wants to tell Kilián that someone has just died (is it Stalin?). Does he need someone to explain to him that the world is not absurd and that we can believe what happens? Is Kilián an absentee (perhaps non-existent) authority fleeing from the consequences of de-Stalinisation? It’s significant that the hero is searching for Kilián even before he borrows his cat. Peter Hames’ complete essay, from which this excerpt is taken, appears in the booklet which accompanies the DVD release.